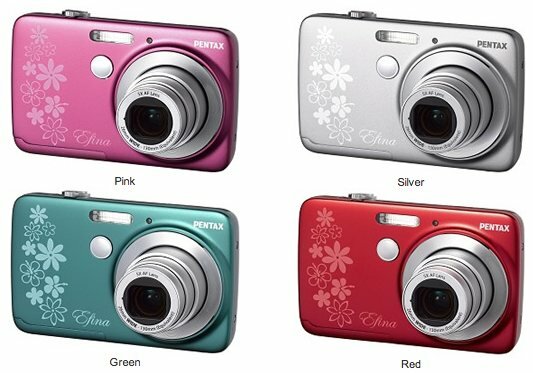 PENTAX RICOH IMAGING COMPANY, LTD. is pleased to announce the launch of the PENTAX Efina digital compact camera. Within a stylish, slender body created with high-quality materials, it offers outstanding specifications to assure the simple, effortless capture of beautiful digital images. Even though it incorporates such outstanding shooting features as an optical five-times zoom lens, high-resolution images assured by its approximately 14.0 effective megapixels and HD movie recording, the PENTAX Efina’s slender, card-sized, metallic body makes it easy to carry it in a pocket or purse. It’s just like carrying a favorite fashion accessory. It also features a host of convenient tools, including a self-portrait mirror placed on the front panel, to assist in the recording of not only memorable trips and keepsake snapshots, but also ordinary everyday scenes. Also featured on the front panel is a lovely, floral design appealing to young women photographers. The Efina also offers a choice of four body colors to satisfy the user’s preference. This model is expected to be launch in Asian countries except in Japan and in China. This entry was posted in Pentax and tagged Pentax K-5 II. Bookmark the permalink. Trackbacks are closed, but you can post a comment.